With their roots as a mutual insurer, Wawanesa is able to help Canadians across the nations get an affordable life insurance plan on their terms. With Wawanesa’s preferred rate program, those in good health can save even more when they protect their families. Wawanesa also offers a robust retirement fund plan through their universal life policy. Lifestyle Term 10, 15, 20, 25, 30 years or to age 80 Ages 18 to 70 Renewable and convertible up to age 80 with no medical exam. Preferred rates available for healthy clients. Available as a single or joint plan. Term to Age 100 with Values For life, paid up at age 100, or in 15 or 20 years. Ages 18 to 80, or 0 to 80 with 15/20 year pay. Guaranteed cash values on many plans. Level cost for the payment period chosen. Universal Life For life, paid up at age 100, or in 15 or 20 years. Ages 0 to 80 Choice of 9 index-linked or fixed interest accounts. Guaranteed cash values in the 5th year, which can be used however you like. Instant Issue Life Insurance 20 years or up to age 85 Ages 45 to 75 Only 5 health questions needed to qualify. Coverage up to $50,000. At expiry, a full death benefit is paid, even if you’re still alive. Quick Issue Critical Illness 10 years or to Age 75 Ages 18 to 60 Covers 14 serious conditions. Optional Return of Premiums may refund up to 100% of premiums paid at age 75. 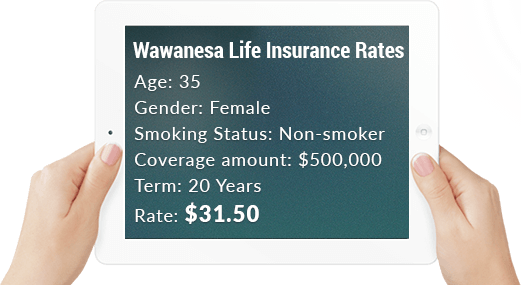 We are pleased to offer all life insurance products provided by Wawanesa. For a quote on all available life insurance plans, please use our no-obligation quote provided on the right to explore your options and find the right fit for your needs.